Cottage in Fontanars is located in the municipality of Fontanars, on the outskirts of the village surrounded by large acreages. 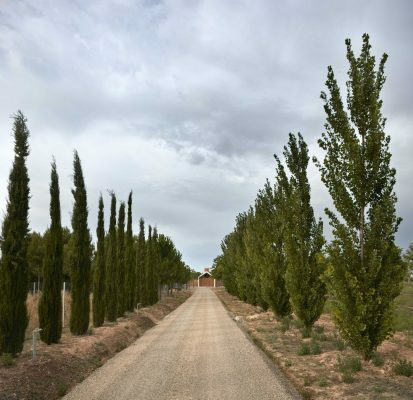 The project seeks the maximum environmental and landscape integration because of its border location between a zone of pine forests and the grapevine fields, being diluted practically in the vegetation. To this contributes the decision to develop the entire program in a single plant, in addition to the material chosen, which provides shade consistent with the place. 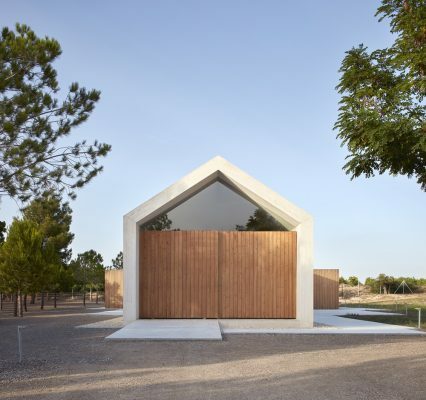 The geometry consists in mapping the line edge that defines the traditional house to extrude it after, forming an envelope under which will be developed throughout the project. 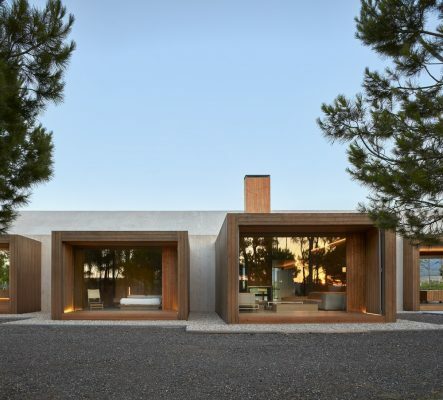 That line-concept, turned into a long concrete shell that organizes the dwellings´ program and is crossed transversely by the rooms materialized as pine wood containers. 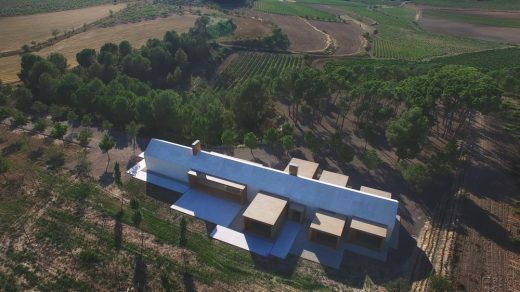 The access to the plot is through a path surrounded by olive trees. 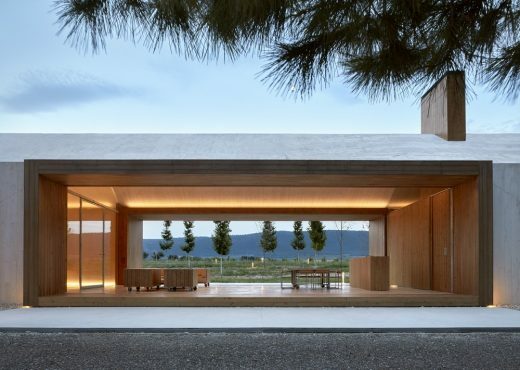 In the background, you can see the house, hidden by groups of cypresses, poplars and pine trees. 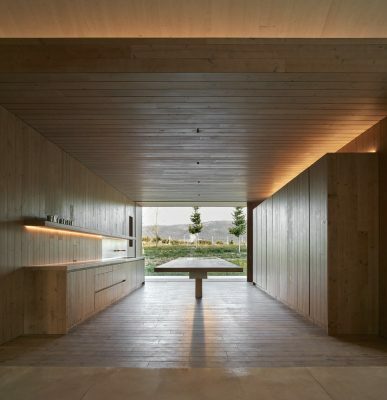 You enter the house through one of the wooden structures. 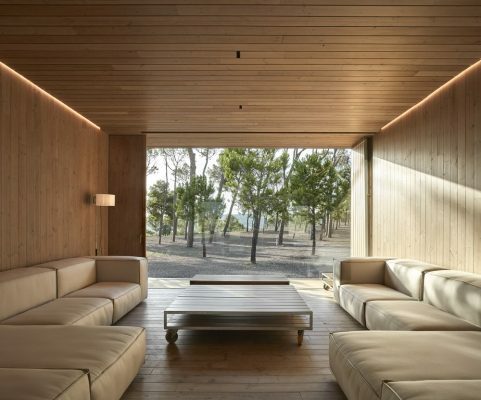 The central space is a fluid common area dominated by a big fireplace towards which all the rooms are opened. 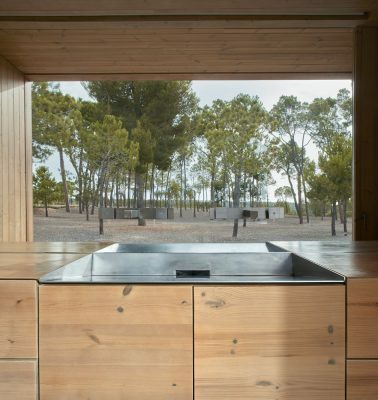 From the inside, the views are framed by the pine wood surfaces that intersect the central space. By being considered a second residence, both these structures and the porches can be totally locked when the house is not inhabited. A wide porch, placed at the end of the house, completes the home. 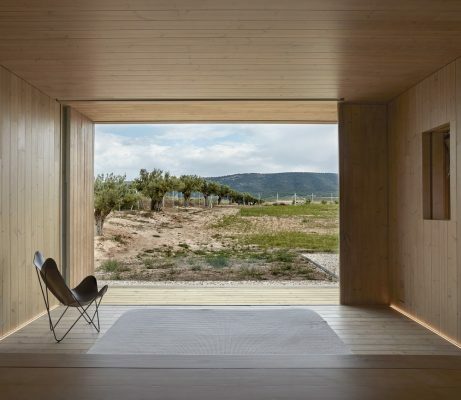 It provides a lounge area linked to a dual landscape, on one side the immediate views of the pine forest, on the other side those of the vineyard. 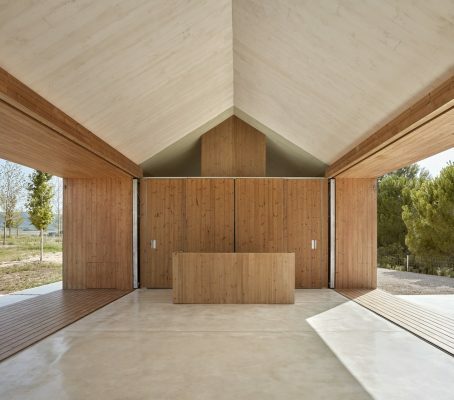 The house is modulated by the timber planks of 20 cm. 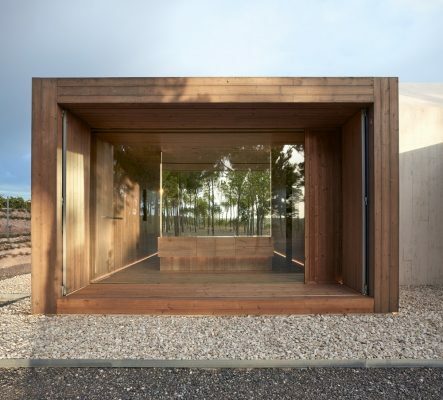 that built the wooden boxes and also the timber formwork for pouring concrete. 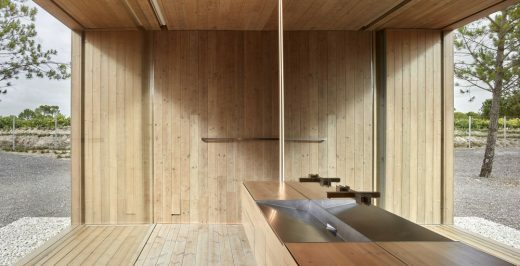 Also the pinewood furniture and the carpentry for this retreat have been specifically designed following the same modulation. 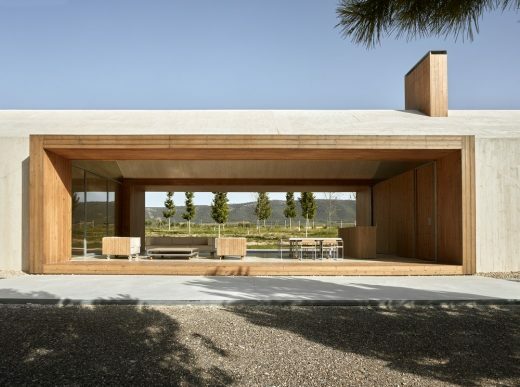 Both materials, white concrete and timber, are coherent with the nature of the structure. The energy saving is optimized thanks to the materials used and a thermal insulation of rock wool with great insulating ability. 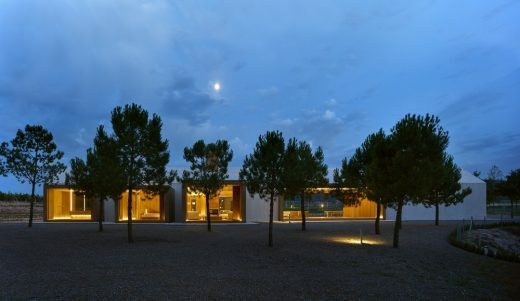 Also, the installation of lighting is energy-efficient due to a control system that optimizes the use of natural light.